Melissa has always loved music. Her father would sing big band music to her when she was a child. Her parents introduced her to rock and roll music in the early ‘60s. These days, Melissa works as a realtor. Lloyd began broadcasting for public radio in 1967 in Davis, CA. He had been fascinated with radio announcing ever since listening to his favorite disc jockeys in Los Angeles in the 1960s. As a child, he loved playing his father’s 78s, and he rediscovered the music of this era in the early 1970s, when his musical tastes changed from rock and roll to big band music. Today, Lloyd spends his spare time increasing the size of his collection of music from this long-ago era. But, when he wants to truly relive the era, he takes his 1936 Ford out for a spin. Lloyd and Melissa take in rescue dogs and spend lots of time walking them and keeping them entertained. They also support local and out-of-state canine rescues. Lloyd and Melissa connected musically when they first met at a rock-and-roll dance, in Van Nuys, California in 1975. With Lloyd’s large 45 RPM record collection, it was a match made in heaven. They were married later that same year, in December. 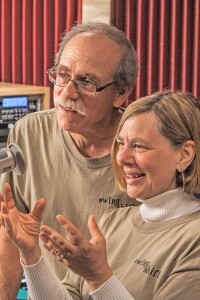 Catch Melissa and Lloyd as they co-host Sunday Swing Shift.